Materials handling distributor Adaptalift Hyster has introduced a new reach truck series ranging from 1.4 to 2.5 tonnes. Hyster new reach truck range offers lower operating costs, better manoeuvrability and better performance in the warehouse. Adapatalift says the new R1.4-2.5 range took 4 years of research and development and features seven models altogether. The new trucks utilises AC technology on traction, pump and steer motors which delivers superior performance in the warehouse. Robust frame and mast construction to ensure a stable and smooth operation when the narrow aisle truck is handling heavy loads, providing excellent residual capacity at heights of up to 12 metres. Durable mast construction incorporating a tilting fork carriage with integral side shift. Front and side load wheel protection come as standard features, to help prevent possible damage during operation. AC technology minimises the dependence on mechanical parts, leading to a reduced cost of ownership over the lifetime of the truck. CANbus technology to help reduce wiring complexity for increased reliability. On board diagnostic display notifies of any maintenance requirements and easily accessible service areas to help simplify maintenance. Great narrow aisle manoeuvrability resulting in faster cycle times in demanding, time sensitive operations, 180 degree and 360 degree progressive steering, high acceleration, and a maximum travel speed of 13km/h with seamless direction changes. Find out more about the new R series reach trucks on Adapatalift Hyster’s website. 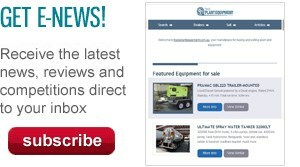 Click here to find Hyster reach trucks for sale. 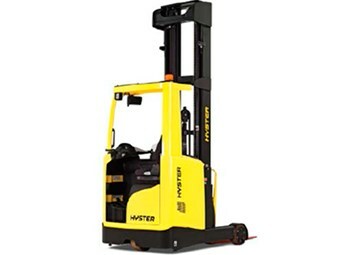 Click here to look up Hyster reach truck specifications.